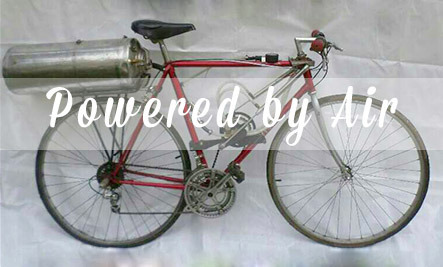 Care2 Healthy Living | How Cool is This Air-Powered Bike? How Cool is This Air-Powered Bike? Cory Little and Josh Powell designed the prototype for a bike powered by air. I’ve always been an advocate for cycling instead of driving, and one of the big obstacles for people making the switch to pedal power is that riding a bike is hard. If you’re riding for transportation rather than for fitness, you don’t want to get super sweaty powering up a hill or from carrying a heavy load. And if you’re not in the best shape, even relatively flat terrain becomes cumbersome after a while. When I worked across town and biked in, I used to envy folks who had a motor assist on their bikes. As I sweated my way up the hill that Atlanta locals call Mount McClendon, these lucky cyclists just flipped on their motors and cruised to the top. Motor-assisted bikes usually use a rechargeable battery, which is sort of a pain. You have to remember to charge it up, and when you do you’re probably using dirty coal power to do it. That’s what makes Little’s and Powell’s idea exciting! Their “Little Motor” is a double-acting cylinder. It’s basically a small steam engine. Instead of electricity or gas, it uses air compression to help you pedal when you need it. As you can see in the video, the air gives you a burst of speed. It’s pretty cool! It’s a bummer that the bike needs more of a pretty factor to succeed on the market, but Tibu does have a good point. People like a pretty bike. Little and Powell are looking for funding to further develop their prototype. If you want to learn more, you can check out their Go Fund Me page. A little tweaking with the design, and this could be a neat product...super Christmas gift!